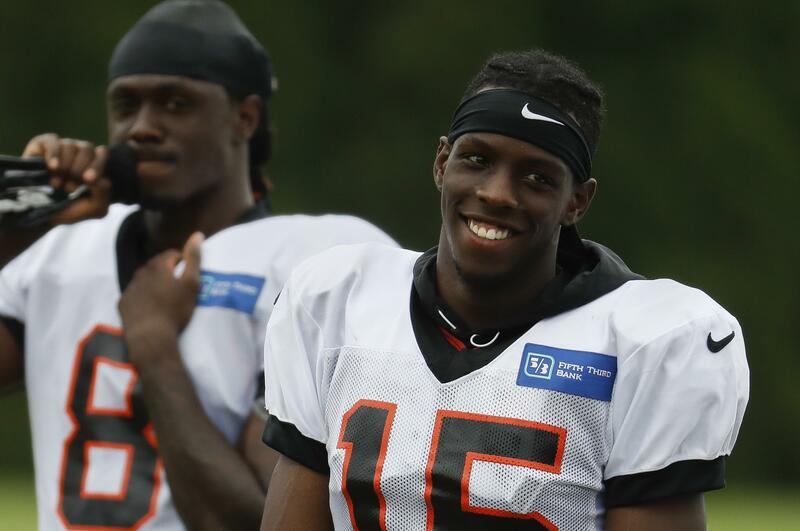 UPDATED: Mon., July 30, 2018, 9:06 p.m.
CINCINNATI – John Ross got up to top speed, ran past a defender and caught Andy Dalton’s long pass in stride, drawing an ovation from the approximately 950 fans watching the first practice of Bengals camp. A day later, he made another impressive catch on a deep throw and heard more applause. Fans haven’t seen any of this since the Bengals made him their first overall pick last year. The speedy receiver from Washington expected to show his big-play ability during his first season in Cincinnati. Instead, he missed most of camp while recovering from shoulder surgery and wound up playing in only three games. He didn’t catch a pass and fumbled on a reverse – the only time he got the ball – before another shoulder injury ended his season. As debuts go, it was about as bad as it gets. He was playing catch-up from the start because of his injury, and every mistake got magnified. The Bengals are trying to dig out of one of the worst seasons offensively in franchise history. They finished last in the league in yards in 2017, a franchise first. Offensive coordinator Bill Lazor was given wide latitude to overhaul the playbook. The offensive line has been revamped. Coach Marvin Lewis has said repeatedly that the offense needs to have more big plays this season, the kind they thought Ross would provide when they took him with the ninth overall pick in the draft. Ross ran a record time of 4.22 seconds in the 40-yard dash at the NFL combine, and the Bengals envisioned him providing another deep threat to A.J. Green. Instead, Ross barely got on the field. This summer he’s been healthy and making a good impression. Ross was still recovering from shoulder surgery when camp opened in 2017 and wasn’t cleared to practice at the outset. He wound up playing in only two preseason games and making one catch for 6 yards, his total contribution to the passing game last year. He’s already way ahead of last year. Published: July 30, 2018, 8:50 p.m. Updated: July 30, 2018, 9:06 p.m.